Cut both ends off the zucchini and discard. Halve the zucchini crosswise, then use a spiralizer fitted with the largest grater blade to cut the zucchini into zoodles. (Halving the zucchini will yield shorter, more manageable zoodles). 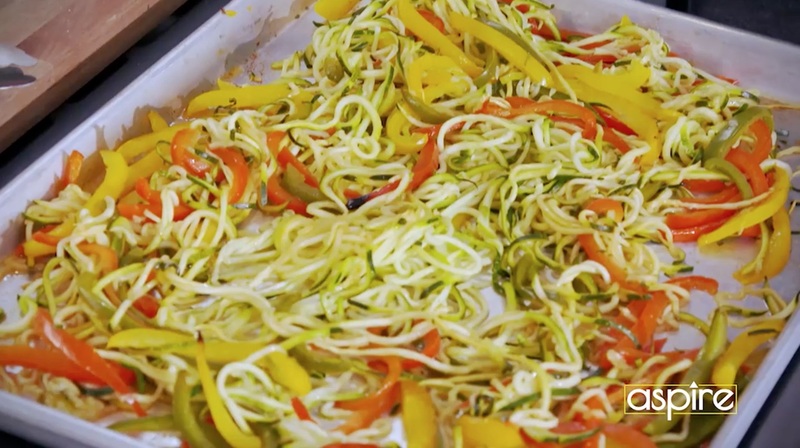 Place the zoodles on a sheet pan along with the bell peppers. Bake in the oven for 6 minutes. Heat the oil in a sautè pan. Add the tomatoes, garlic, and onions, then saute for 2 to 3 minutes. Add the vegetable stock and simmer for 8 to 10 minutes. To serve, remove the sauce from the heat and serve alongside the zoodles, sauce can be spooned over the zoodles.